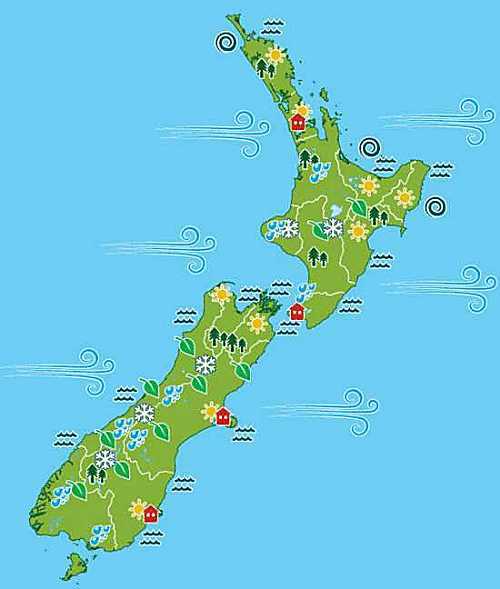 The Ministry for the Environment NZ climate impact map (a digression this, to be sure, but it must be said) — pure fiction, created to frighten children, the scoundrels! Why have they stopped using the tried-and-true method of examining historical weather records to predict the limits of future climate? Why do they trust the output of computer models when they are unverified and their predictive skill is zero? If the models give skilful predictions, why does the IPCC give us umpteen possible futures and tell us: “pick one”, saying “we don’t make predictions”? Why do they believe the models when the IPCC declares that our scientific knowledge of the climate is “poor”? In other words, we don’t have a clue how the climate works — so we don’t know if we dominate the climate. Our Environment Ministry should explain themselves then start thinking for themselves and not just believe uncritically what issues from Greenpeace and the IPCC. The official temperature record is wrong. The instrumental raw data correctly show that New Zealand average temperatures have remained remarkably steady at 12.6°C ±0.5°C for a century and a half. NIWA’s doctoring of that data is indefensible. The NSS is the outcome of a subjective data series produced by a single Government scientist, whose work has never been peer-reviewed or subjected to proper quality checking. It was smuggled into the official archive without any formal process. It is undocumented and sans metadata, and it could not be defended in any court of law. Yet the full line-up of NIWA climate scientists has gone to extraordinary lengths to support this falsified warming and to fiercely attack its critics. For nearly 15 years, the 20th-century warming trend of 0.92°C derived from the NSS has been at the centre of NIWA official advice to all tiers of New Zealand Government – Central, Regional and Local. It informs the NIWA climate model. It is used in sworn expert testimony in Environment Court hearings. Its dramatic graph graces the front page of NIWA’s printed brochures and its website. Internationally, the NSS 0.92°C trend is a foundation stone for the Australia-New Zealand Chapter in the IPCC’s Third and Fourth Assessment Reports. In 1994, it was submitted to HadleyCRUT, so as to influence the vast expanses of the South Pacific in the calculation of globally-averaged temperatures. Hon Rodney Hide, a climate sceptic who is a Minister in the current Government and leader of the junior coalition partner, the ACT Party, has called upon his ministerial colleagues to formally repudiate the NSS and to withdraw all publications and formal papers which are based on the spurious warming trend of 0.92°C. The Government has not yet responded to this challenge. New Zealand is a small country, with a strong tradition of open Government, and is not an easy place to keep secrets. The acceptance of the NSS for so long offers evidence of the dictum: “you can fool all of the people some of the time..” But if that can happen in New Zealand, how much greater is the probability that similar shenanigans could be happening in larger, more complex, jurisdictions? The New Zealand Meteorological Service, with its forebears, has been measuring and recording our weather since 1861. In 1992, it published a booklet containing a detailed history of all its weather stations, along with 140 years of climate data. In that year, NIWA came into being and has now published most of the Met Service data online. In 2007, the then Prime Minister announced her party’s intention that New Zealand should lead the world in fighting climate change, and aim to be the world’s first carbon-neutral country by 2025. These are remarkable claims. They came out of the blue and do not accord with any written histories, or the personal impressions of our older generations. They don’t square with “hottest day” records held in provinces and city archives. They were not accompanied by big changes in rainfall or winds or sea levels. In these claims, NIWA is a very lonely orphan. Global warming during the 20th Century was 0.6C, with a margin of error of +/-0.2C. The Southern Hemisphere warming was less than half that level. But New Zealand warming, according to NIWA, was almost twice the global average – and with no error margins mentioned. Referring to the NIWA web page, one finds that this major warming trend is the product of a single study involving only 7 temperature stations – out of the 238 stations which currently report to NIWA. In response to a request under the Official information Act, NIWA has disclosed that this study was undertaken as part of a student’s thesis some 30 years ago. NIWA has no record of how the NSS came to be in their computers. The only reasonable inference is that the student himself, one Jim Salinger, must have added it when he became NIWA’s Principal Scientist many years later. How do we know the NSS is wrong? Tables, which form the most reliable data for judging of the Climate of New Zealand, are extracted from the Reports of the Inspector of Meteorological Stations, for 1867. The mean annual temperature was 55.6°F — the equivalent of 13.1°C. The national average temperature of 13.1°C made 2005 the fourth warmest year nationally since reliable records commenced in the 1860s. No change whatever in 138 years! In fact, if 2005 was warmer than most 21st century years, New Zealand has obviously experienced some cooling during the past century or so. Secondly, the University of California Libraries has a booklet “Climate and Meteorology of New Zealand” prepared by Lt-Colonel DC Bates for the “New Zealand Official Year Book 1920” (also available on the web). This sets out the mean temperature records for the seven-station series over the 56-year period from 1863 to 1919 – showing the average over that period as being 12.67C. The author, who was the Dominion Meteorologist, claims that “Wellington, the Capital City, has a mean climate for the whole Dominion”. Wellingtonʼs mean temperature over the period 1863-1919 was 12.94C. The NSS graph directly contradicts this official contemporary record. Straight away you can see there’s no slope—either up or down. The temperatures are remarkably constant way back to the 1850s. Of course, the temperature still varies from year to year, but the trend stays level—statistically insignificant at 0.06°C per century since 1850. Putting these two graphs side by side, you can see huge differences. What is going on? Why does NIWA’s graph show strong warming, but graphing their own raw data looks completely different? Their graph shows warming, but the actual temperature readings show none whatsoever! So the NIWA warming trend was revealed as entirely man-made, and all within NIWA’s own office. There was no external peer-review. To this day there hasn’t even been an internal review or any form of quantity control. There is no documentation. Since November, the ACT party has been trying to obtain details and/or justification for these extraordinary adjustments – but forty Parliamentary Questions later, we still don’t have that information. There is a fourth basis for knowing this SSS is wrong. NIWA have said that they regularly send their station data to the compilers of the three international temperature series – HGCN, NASA and HadleyCRUT. These three operate independently and make their own adjustments if they believe any station data is suspect or unrepresentative. Although HadCRUT has followed some of NIWA’s adjustments, none of the international series show New Zealand as having warmed substantially prior to 1975. In the case of HGCN, whose computer code is publicly available, there is no material New Zealand warming during the last 100 years, except for the increase arising when Campbell Is was dropped from the dataset. A systematic analysis of all New Zealand climatological stations with sufficient length of record reveals that no important change in annual mean temperatures since 1930 has been found at stations where the above factors [shelter, screenage and urbanization] are negligible. Neighbour station comparisons support these findings. When views differ, it is is customary to prefer the judgment of the experienced practitioner over that of the student. It is certainly sensible to prefer a peer-reviewed paper published in a reputable journal (which has never been challenged) over that of an unpublished private document – especially where obvious conflicts of interest arise. What Dr Wratt has consistently said is that, because New Zealand is surrounded by oceans, all the modelling indicates that the temperature impacts of climate change are most likely to be less for New Zealand than for other parts of the globe. So the NSS claims New Zealand has warmed much more than the global average, while the NIWA climate chief cites the theory that our warming should be one-third less than the global average. They can’t both be right. If the NSS is right, then not only Nick Smith and David Wratt are wrong. Mr Jim Hessell is wrong, the 1920 Dominion Meteorologist is wrong, the Royal Society is wrong, HGCN, NASA and HadCRUT are wrong, and the Met Service records are wrong. So we have six very good external reasons why this SSS should be regarded as wrong, and formally repudiated by the Government. Let me turn to internal reasons why the SSS should go — first internal to the document itself, and then internal to NIWA. As previously mentioned, the consequent warming trend is well above the global average for the century, and even further above the Southern Hemisphere average. Even greater discrepancies from global movements appear when the record is broken down to its 3 component periods: 1909-50,1950-75 and 1975-2009; The third quarter of the 20th century was a cooling period all over the globe, but the NSS shows the fastest warming in New Zealand history (0.24C per decade). According to the Schedule of Adjustments tabled by the Minister in February 2010, the seven stations have been adjusted no less than 34 times. In a normal unbiased series, one might expect that about half of these amendments would be favourable to a warming trend, and half would be unfavourable. Pre-1950, 21 movements were negative and only 5 positive; post-1950 there were 2 negative and 6 positive movements. So, by number, 80% of the NIWA ‘corrections’ favoured an upwards trend. Pre-1950 the downward adjustments (unweighted) summed to 11.3C whilst 2.7C (all in Dunedin) went the other way. So, by temperature, 80% of the NIWA ‘corrections’ were trend-favourable. Over the entire series, a total of 515 years were adjusted. Of these, no less than 467 years contributed to an upward-sloping trend line. So, by year, 90% of the NIWA corrections leaned in the same direction.The ratio of 9 out of 10 adjustments being ‘helpful to the hypothesis’ could surely not have occurred in the absence of bias. These over-the-top outcomes reek of bias and data manipulation, robbing the series of any vestige of scientific plausibility. NIWA is accredited under ISO9002, which requires that the steps in each process be fully documented. When the New Zealand Climate Science Coalition made a formal request under the Official Information Act for either paper or computer records relating to the construction of the SSS, they received NOTHING in response. In answers to Parliamentary Questions, NIWA was unable to produce any internal records whatever. Even when they referred to losses of computer data, it was somebody else’s computer and happened 28 years ago. How could NIWA defend this graph, or the causative adjustments, in the event of a challenge in any Court proceedings? It has no paper trail, and no supporting documents. NIWA don’t really know how it got there, and they can’t reproduce it or the reasoning behind it. For that matter, how can they defend using the graph as the basis for advice in Parliamentary proceedings? NIWA has no record of any discussion or decision regarding adoption of the seven-station series. It obviously existed by 1994, because NIWA sent it to the UK Hadley Centre in that year. But in 1997, it is mentioned in a paper published by NIWA employees (Zheng et al) as being the property of Dr Salinger personally. It then burst into the public arena in 2007, first on NIWA’s website and then in the printed brochure, at a time when the Climate Group’s principal scientist was none other than Dr Salinger. There is no record of Salinger declaring a conflict of interest, or excusing himself from any NIWA process for selecting a national temperature series or an iconic graph. There is not even any record of a process or a decision. It was just done. If this view is correct, the SSS is irretrievably tainted by self-interest, personal bias and abuse of trust – and is wholly illegitimate. It should never have been used on a government website in the first place and it should now be formally repudiated. In the face of all these obstacles, why has NIWA persevered with the 30-year-old Salinger methodology – which they never agreed to adopt in the first place? Could it be that Dr Salinger was so well-trusted by his peers and superiors that they could simply accept his bare assurance that all was well? First, they fired him for his persistent refusal to accept direction, or to follow company policy, or to cease talking to the media. He appealed to the Employment Court for reinstatement, but NIWA fought that hard for most of last year, and were ultimately successful. Secondly, when the SSS was criticised in “Are We Feeling Warmer Yet”, Dr Wratt did not respond with a Salinger argument. Instead, he invented a whole web page describing how the Wellington record had been adjusted for altitude changes, and had a Minister table that in the House. Wratt’s misleading conduct, which is a serious matter, seems to have been motivated by his distrust of the Salinger method. Thirdly, NIWA published a new paper called “The NIWA ‘Seven-Station’ Temperature Series” on 3rd February, written by Dr Brett Mullan, which sets out details of 34 temperature adjustments. These have been compared with their counterparts in the Salinger thesis and only one adjustment is the same! This new Schedule of Adjustments does not even pretend to follow the 1981 Salinger precedent – but avoids disclosing that fact. The NSS has not been retained out of respect for Salinger. The only remaining explanation is that NIWA and the Climate Ministers are attempting to save face rather than confess that they have been running their policies on the basis of bogus data for many years. Piecing together the provenance of the New Zealand historical temperature record has been no easy task. Much of the detail is set out in the Climate Conversation blog. It has involved a myriad of investigative methods but the most productive has been the placement of nearly 50 Parliamentary Questions for Written Answer, for which credit must go to John Boscawen MP. The New Zealand mainstream media, all highly partisan on climate change matters, have evinced little interest in the scandal to date. Science claims a special place in the trust of the public because of its unswerving adherence to certain objective methodologies, involving transparency, peer review, replicability and honest purpose. NIWA has forfeited that trust in so many ways. The Hon Barry Brill OBE is a New Zealand barrister and solicitor. He is a former Minister of Science & Technology, and Minister of Energy, and is currently chairman of the New Zealand Climate Science Coalition. Bravo! A thorough demolition. How anyone will be able to gainsay this I can’t imagine. Read the Wikipedia item on “When Prophesy Fails” by Festinger and others. Its not a perfect match by any means, but enough of the elements are there. First, become a believer in the doom approaching, second make some sacrifices.. like to integrity (Hide the Decline, Mikes Trick), third when the prophesy of doom fails to come.. recruit more support so the pain of failure is well spread amongst experts and the population, fourth, find a reason why the doom didn’t arrive (eg, the world had done just enough to stave it off) and fifth reread Paul Ehrlich, “The Population Bomb” for hints on the next disaster to promote. I’m not sure where we are on the timeline for the AGW scare, but I suspect it will have to be the imminent demise of the Poles.. this will entail massive snow melts of thinning ice getting into the ocean currents and causing the severe Northern winters of late. Oh, and a bit of housekeeping.. when the first Polar blasts arrive from Antarctica, don’t forget to reset your clock from “Global Warming” to “Climate Change”. Pingback: Climate Conversation Group » Ice, anyone?